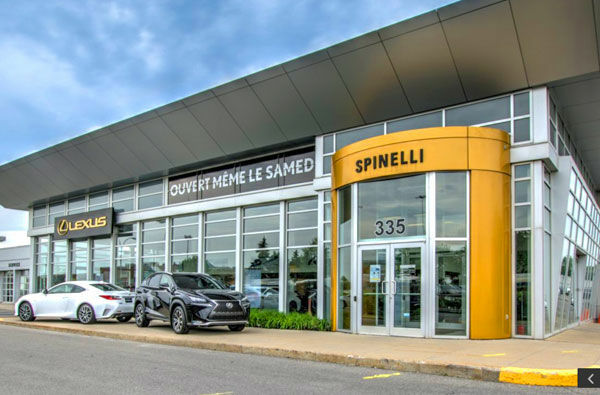 Located on Brunswick Boulevard in Montreal, Spinelli Lexus Pointe-Claire is your trusted dealer for purchasing or servicing your Lexus in Montreal. At Spinelli Lexus Pointe-Claire, you will find everything you need for your Lexus’ after-sales service as well as courteous and respectful service at our new and pre-owned vehicle departments. At Spinelli Lexus Pointe-Claire, our commitment to customer service is our top priority. That's why our team will be present for you and answer any questions you might have. If you are looking for a new Lexus vehicle in Montreal, come into Spinelli Lexus Lachine today. You'll find a complete inventory of new Lexus models like the Lexus RX, Lexus NX, Lexus IS and Lexus RC, and a full range of hybrid Lexus vehicles. We also have several high-quality pre-owned vehicles to offer at competitive prices, in addition to all the after-sales services you need for your Lexus. Spinelli Lexus Pointe-Claire also offers a complete tire centre and exclusive programs such as the My Spinelli loyalty program. For more information on new Lexus vehicles as well as on our after-sales services, contact us by phone today at 1 844 725-3436, or by using our online contact form.